The rose Trellis is gone and a duplicate Wisteria trellis is in it's place. 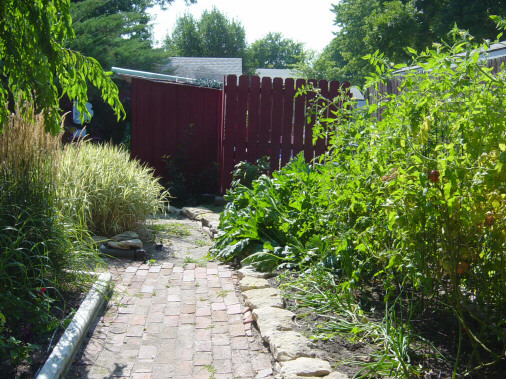 The trellis and Virginia Creeper was moved and another path into the center under a new arbor. Got this area cleared out to make way for about 20 feet of Trellises that are quickly being over grown with Virginia creeper. Just as we have done before, sod cutter and then lawn timbers... instant path- ways & raised beds in the other half of the back yard. Painful & expensive, we emptied the pond and removed the stump and recruited some experts to get this gorgeous new waterfall.